What is Salford 4 Good? Salford 4 Good is a charity that makes it easier for people and businesses to support and give to good causes across Salford. There are over 13600 local charities and community groups in Salford and they all do a fantastic job to help improve the quality of life and wellbeing of people in living in Salford. Salford 4 Good aims to support these good causes to make Salford a great place to live, work and visit. Who are Salford 4 Good? We are a charity initiative led by a partnership of 5 Salford based community organisations. Find out more about these five partners. The key purpose of Salford 4 Good (S4G) is to support and strengthen the work of charity and voluntary groups across the City of Salford. What does Salford 4 Good do? We're about everybody getting involved to help make Salford a great place by supporting our local good causes. S4G aims to create and support relationships between local people, communities and businesses by making it easier for individuals and organisations to give time, skills, money and resources to local causes. There are plenty of ways to get involved with Salford 4 Good from donating your time as a volunteer to giving money as a donor or fundraiser, and much more in between! Salford 4 Good actively fundraises across Salford by hosting fundraisers and attending events to develop funds and to support the promotion of Salford’s good causes. We also support groups to fundraise via our online giving shop. This shop allows local causes to ask their community to support their activities by purchasing items or resources they need. Take a look at our shop today... shop now! 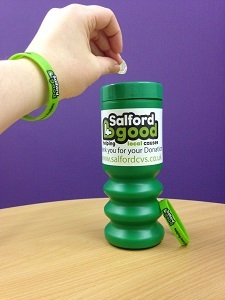 We aim to support individuals who would like to raise money for good causes in Salford. Whether it be promoting a fundraising event or supporting the setup of a sponsored activity like a swim-a-thon or a sponsored silence. 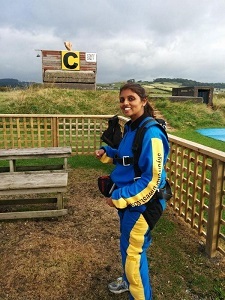 If you have a fundraising idea S4G could help develop and support it! 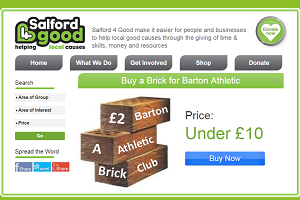 Salford 4 Good supports charities, voluntary and community groups and social enterprises. 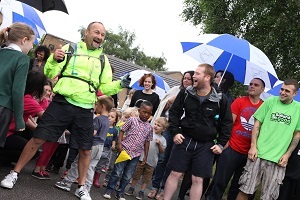 We champion good causes across the city by promoting and supporting group activities. From promotion on the S4G website and twitter pages to inclusion on our online giving shop. In 2016 Salford 4 Good was able to offer its first Grant Awards Scheme, the Fund 4 Good! This fund was made possible by public donations, individual fundraisers and support from organisations across Salford. The Fund 4 Good was able to support 7 Salford causes this year and S4G are continuing to develop fundraising activities and income streams to help create a second round of the Fund 4 Good. If you’d like to know more about what we are up - join our mailing list.